ARTEMIDE CABILDO LED SUSPENSION has body in painted die-cast aluminium. The indirect light shapes the body lamp, bringing out its winding form and giving it the astonishing appearance of a ring of light. The suspension cables are also feed cables. 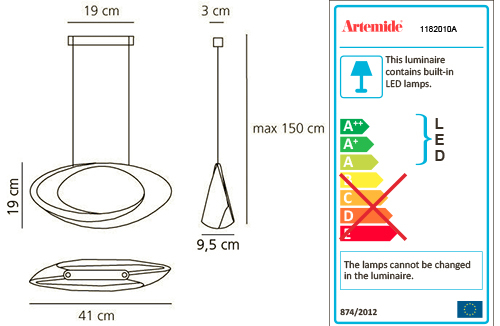 Integrated LED not replaceable, 3000K, 44W, 2824lm, CRI=90 Dimmerabile (Push).